Appearing for the first time in written records, on the occasion of the famous battle of the Sardinian sea (approx. 540 BC), the city of Cerveteri in reality dates back to the middle of the 9th century. Archaeological research has ascertained the presence of settlements and their relative necropolis, Sorbo and Cava of the Pozzolana (with buried ruins from as far back as the end of the Bronze Age) situated towards the north-west and south-east borders of the tufaceous plains, between the rivers of Manganello to the north and Mola to the south. 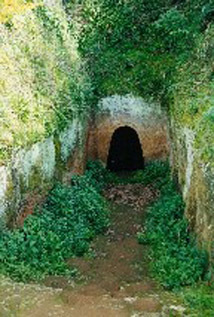 It was on the plain that the Etruscan city would be developed. Founded according to the Pelasgian tradition , the mythical population of Greek origin, the Etruscan centre named Kaisrai ( Agylla for the Greeks and Caere for the Romans) rose up following the evolution of small prehistoric Villanovan settlements. This was due to the constant contact with Greek culture and thriving trade relations with the Phoenicians which can be attributed to the middle of the 8th century BC. The change in social conditions, marked by the development of more articulate settlements organized into pyramid type structures with noble families at the head, is well documented by the extension of cemeteries or funeral areas in the high plains of the Banditaccia and Mount Abatone which were characterized in great part by prince like graves and tombstones. The city, however, was to enjoy its most flourishing period in the course of the 6th century BC when trade reached its peak and the centre became a meeting place for hundreds of artists from Greece and in particular, the Ionian islands. This development is also well noted not only by the growth in the number of inhabitants and extension of the necropolis, but also in the wealth of the port of Pyrgi and its sanctuaries (today known as Santa Severa). As well as numerous offerings , material and architectural decorations, the sacred area has also rendered the famous golden plates one Etruscan and the other Phoenician which testify to the excellent trade and political relations between Kaisrai and Carthage. These two allies were famous in the noted battle of the Sardinian Sea fought against the Focsi. However, at the beginning of the '70's in the 5th century BC the first signs of a crisis appeared marked in particular by the conflict with Greek traders. During the next century and at the beginning of the 3rd century the situation worsened. In spite of the fact that Caere established political ties with Rome initially and even received the Vestals during the invasion of the Gauls in 390 BC, towards the first decades of the century, the city was involved in the war between Rome and Tarquinia and as a consequence it succumbed and was to become annexed the eternal city in 273 BC. The second and third centuries were marked by a gradual Romanization of the centre so much so that city was governed by the Prefect of Rome and local families commenced a progressive entry into the Senate. At the beginning of the Imperial age, the geographer Strabone remembers Caere as an ancient illustrious city, even if he complained of the scarcity of its ruins, the only exception being the Aquae Ceretane a thermal springs complex containing sacred characteristics which is located in the area of Sasso di Furbara. 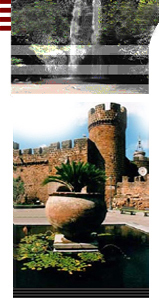 Cerveteri's medieval history is certainly less well known and not as rich as that of ancient times. In fact the city went through a troubled period during this time, between the 9th and 10th centuries. It was ruled by an oppressive, turbulent regime, and was also affected by the events involving Rome; the invasion of the Saracens. In that time the area was gradually abandoned and trade suffered to the point that it became uncultivated land. The situation was accentuated when, at the end of the 12th century, the city ruled by the Diocese of Port, fell victim to an epidemic and its inhabitants were forced to move to the Borg of Ceri. The city centre flourished again but only much later on in 500 when Caere Vetus (renamed in opposition to the new settlement area Ceri) became part of the principality of the Ruspoli family which would leave its most significant mark with the acquisition of Castle Orsini. The castle is situated in the centre of the modern city and is home to the National Cerite Museum.